Junk and Rubbish Removal Services in Montana. At 1844-Junk-Rat – junk and rubbish removal in Montana is made easy… because we do all of the work! Clients in Montana know that 1844-Junk-Rat.com is the company to call when looking to remove unwanted junk. If you need an old shed hauled away, branches removed, piles of scrap wood, old appliances or even construction debris disposed of, we are here to help. 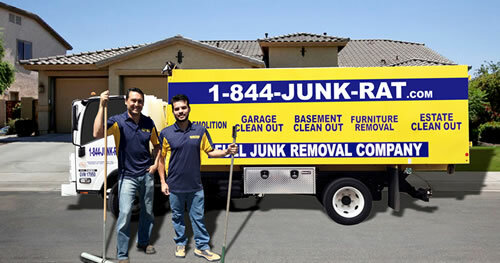 We are the junk people and strive to offer our customers the best service possible at the lowest rate around. No project is too small and no item is too large for our professional hauling team. We make sure all of your waste is disposed of in an eco friendly way through donation and recycling-all at no extra charge. Scheduling an appointment with 1844-Junk-Rat.com is easy and hassle free. We remove your junk safely, efficiently and quickly. Call us with confidence, we make sure to work around your schedule while offering service with a smile. I just finished cleaning out my whole house with 1844junkrat.com/. I really can’t find the words to express all of the positive things about this company. They were very professional, highly efficient, super friendly and patiently kind. Any one who has stayed in a house for a while understand that getting rid of everything can be a very emotional process. The guys really made the whole thing easier by being efficient and even making several good natured jokes when I seemed to be overly sad. I got quotes from a few other companies who had fewer ratings but ended up with higher rates. 1-844-JUNK-RAT.com was really affordable and undercharged for the amount of work they did in my opinion. There were no random charges added after the work was done, and they were also really good about keeping things organized for recycling. They even offered Printer Recycling for a couple of my old machines that I had totally forgotten about. The whole experience was really terrific.